Heritage Place Winter Mixed Sale enjoyed significant increases in both average and median at the just concluded two-day sale in Oklahoma City. 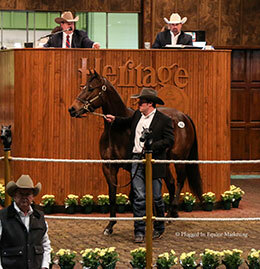 OKLAHOMA CITY, OK—JANUARY 19, 2019—Heritage Place brought down the curtain on its 2019 Winter Mixed Sale Saturday with a strong closing session, as the two-day auction ended with an increase in average and median. The sale would have enjoyed across the board increases however 207 less horses were offered when this year's sale was a two-day affair compared with three-days over the past several years. "We are very pleased with the second day," Heritage Place General Manager Spence Kidney said late Saturday. "The market held strong for consignors with 89% of the horses offered marked sold." The cumulative average price of $11,757 exceeded the 2018 average of $10,652—an increase of 10%. The median price rose a healthy 18% to $7,700 compared to $6,500 in 2018. Heritage Place reported 610 horses grossed $7,171,800, down 7% under the $7,723,000 paid for 725 horses in 2018. The 78 horses that did not sell represented an RNA rate of 11%, compared to 25% a year ago. "Heritage Place wishes everyone good luck on their purchases and certainly a big thank you to our consignors for a quality offering for 2 days," Kidney added. Hip 165 Jess So Sixy, who sold on Friday, was the sale's high-selling broodmare for $115,000. Cavenaugh QH LLC purchased the stakes winning and stakes producing daughter of Mr Jess Perry from Lazy E Ranch, LLC Agent for John Andreini. She was in foal to champion sire Tempting Dash. On Saturday Ken O'Brien paid $63,000 for Hip 711 Cant Contain Her, a sister to stake winner and track record holder Reacher 16 and a half-sister to five other black type to include 2018 AQHA Racing Champion 2-Year-Old Filly contender Lynder 16. Bob Moore Farms, LLC, Agent consigned the 7-year-old Inseperable mare bred to world champion sire FDD Dynasty. She is out of the Corona Cartel mare Tinys Corona Queen. Turner Farms paid $88,000 for the high-selling short-yearling, Hip 255, Apollitical Effort, a colt by Apollitical Jess from the Strawfly Special mare Strawfly Sting on Friday. Roger Daly, Agent for Ken Phillips consigned the half-brother to stakes-placed Sizzling Gold and stakes-placed Aberdonian who sold on day 1. Two short-yearlings brought a final bid of $60,000 each during Saturday's session. Hip 549 Mach Won was purchased by Cavenaugh QH LLC for $60,000. The brown colt by champion sire Valiant Hero is from the first crop of grade 3 Speedhorse Futurity winner Fast N Fancy, a Pyc Paint Your Wagon sister to five black type. Bobby D. Cox consigned the colt. Felix A. Gonzalez also paid $60,000 on Saturday for Hip 558 C Special Jess, a colt by leading sire Apollitical Jess from the Shazoom mare Tiny Shazoom. Lazy E Ranch, LLC Agent for Greg Cullum consigned the sorrel gelding whose second dam is the champion filly and multiple stakes-producer Tiny First Effort. Cavenaugh QH LLC was the sale's leading buyer with seven purchases grossing $311,0000. Pleasant Valley Ranch paid $252,200 for 15 head and Bobby Simmons signed tickets totaling $193,400 for 14 head. Bobby D. Cox led all consignors and agents for the two-day sale with 54 head grossing $792,300. Lazy E Ranch, LLC Agent for John Andreini had 33 head gross $736,000 and Lazy E Ranch, LLC Agent sold 38 head for $645,900. Apollitical Jess was the sale's leading sire of short-yearlings (by average with two or more sold), with three head averaging $64,000. Valiant Hero had two average $39,000 and Pyc Paint Your Wagon had six short-yearlings average $17,450. Tempting Dash led covering sires for the sale (by average with two or more sold), with two pregnant mares averaging $66,000. FDD Dynasty had two in-foal mares average $45,000 and first-crop sale sire Jess Good Candy had three average $31,333. For preliminary results from Friday and Saturday, and hip-by-hip results, CLICK HERE.